Candles are especially enticing to pets. Fortunately, battery-powered LED candles eliminate the risk of singed whiskers, burns, or house fires. 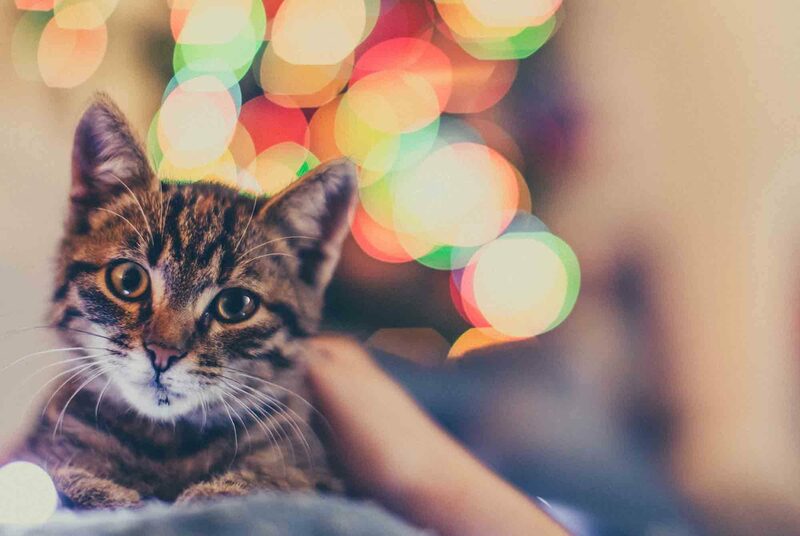 The festive holiday tree can be irresistible to pets. Climbing, knocking it over, and even getting stuck on inner branches are all potential hazards for your pet. Tree water reservoirs can contain trace amounts of fire-retardant or fertilizers; do not allow your pet to lap up a drink from beneath the evergreen. Holly berries, mistletoe, and poinsettias are all considered toxic to pets curious enough to take a bite. Holiday pet safety hinges on the items we look forward to all year. Yes, foods smell and taste amazing, and even the most well-behaved pets cannot hold back from surreptitious samples. Caution your guests against feeding your pet from the table. Remember, your pet may beg you for a taste from the turkey or ham. Because they can splinter, break, and cause animals to choke, we advise against giving your pet leftover bones. Hosting? Please create a nice, quiet, comforting, and safe haven for your pet to get away from all the action. This is good news for a pet that’s already crate trained. Otherwise, simply encourage your pet to chill out in a back bedroom among various creature comforts. Update your pet’s microchip, if applicable, and make sure tags can be read clearly. Many pets bolt out the constantly-opening front door or become so stressed that they try to escape the environment. While jolly, presents festooned with waterfalls of ribbons should never be left out in case your pet is curious (and who has a pet that isn’t naturally curious?). Keep them secured in a closed cabinet until it’s time to open gifts. Wrapping paper can also cause choking, GI problems, or worse. Clean up paper and packaging as soon as possible. If our veterinarians and staff can assist you with additional holiday pet safety questions, we invite you to contact us. We’re always here for you, and we hope your family has a safe holiday season together!